Now that it is getting very cold here in Hogtown, if you are out and about in such weather, it can be helpful to know where you should go to get The Best Hot Chocolate in Toronto. 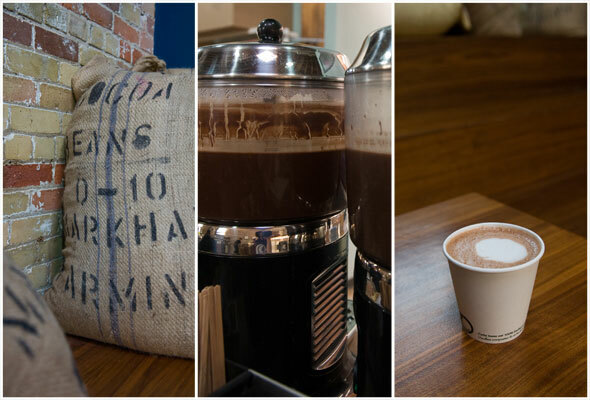 BlogTO has a rundown of some great places to go for this wonderful hot beverage. As an aside, I love going to Aroma for their hot chocolate. They drop a big chunk of chocolate into hot steamy milk and you stir: delicious. However, while you won’t find it in the article, you will see people argue for it in the comments. Regardless, if you go to Aroma or any of these other places, you will (almost) appreciate the cold weather better once you have one of these drinks from one of these places. Kudos the the government of Canada. As well as the signifigant relief funds Canadians are providing, the Canadian government has cancelled Haiti’s debt to Canada and is urging other creditors to cancel Haitian debt. Indeed, Canada’s…. “…Finance Minister Jim Flaherty urged Haiti’s international creditors Wednesday to cancel the country’s debts following the Jan. 12 earthquake that killed 200,000 people, including 21 Canadians. If you are not a Canadian, contact your local political leader and ask them to follow the Canadian government’s lead. Are you an aspiring Canadian filmmaker? If so, then check out the NFB’s web page, Hothouse » Hothouse 6: Call for Submissions. They are looking for talented filmmakers like you for a 12 week paid apprenticeship. You’ve got until February 19, 2010 to apply. You can do it! Go to the site for entry details. And when you win, come back here and tell me! Thanks! Well, it likely has nothing — NOTHING! — on the 19 most complex and dangerous roads in the world. The other 18 are just as bad. You have to see it to believe it. This is a great article (Overhyped, Overpriced & Disappointing: iPad? No, iPod in 2001) that shows that alot of the comments for the iPod were very similar to the iPad. If anything, the iPod likely had a more difficult going over. I highly recommend the article and especially the comments that it links to. As a side note, it is remarkable that back in 2001, the iPod was going for $399. Now the iPad is going for $499. That’s quite striking in it’s own right. Now, technically this is trivial to get around. But it could still make money if larger organizations such a school boards mandate that teachers must pay for such things. This may not make sense to individuals, but large organizations sometimes will make such a call. And not just public organizations, but private ones as well. I don’t believe it will make alot of money, and it won’t stop the march towards a new journalism that recognizes that people will no longer pay directly for news. But it could be more successful than one might think. Reading this article, Squeeze an Extra Hour Out of Your Busy Day – Time management – Lifehacker, I thought: that’s all fine and good, but what I want is less busy time, not more. I want more weekend. Likely you do too. One simple way of doing this is to actively plan your Thursdays, Sundays and Mondays. For Thursdays, try and arrange for a relaxing or enjoyable activity to do Thursday evening. It could be going for coffee or drinks, or seeing a show, going book or window shopping, or going out for a nice dinner. Anything that makes Thursday night more special than Monday, Tuesday or Wednesday night. If I do that, even though I have to work on Friday, I feel like the weekend has already started. As for Sunday and Monday, it is a similar idea. Even if you find your weekend busy, try to schedule the busyness and chores before Sunday evening and try and make Sunday night enjoyable, even if it is taking extra time to relax. So many people I see — via email — that they have already started their work week on Sunday night! They not finished working on Saturday morning and they start working on Sunday evening! If they are lavishly rewarded for this, then fine. Otherwise, they need to better manage their time Monday to Friday so that that doesn’t happen. And they certainly need to manage their time so that they enjoy Sunday evening. Finally, try to extend your weekend into Monday as much as you can. If you can have a relaxing breakfast, or a special lunch, or just meeting a friend for coffee on Monday, you will have eased into the week nicely and the next thing you know, you are already launched into the work week. For the rest of the week, work hard. But when it comes time to relax and play, play hard too. It’s your life: make the most of it. Extending your weekend is one way to do that.